Actress Ava Gaudet is an American television, film, and theatre actress and singer from Providence, Rhode Island. Ava is of French descent from a family of performers. The pretty brunette appears on NBC’s new hit Love Bites as a guest star. Ava rocked a full head of lush layered brunette hairstyle for her role. Anyone can copy Ava’s hairstyle if they have long layered below the shoulders medium to thick hair. The style can also be achieved with the help of clip-in or fusion extensions to add instant layers and hair bend. 1. Cleanse hair in lukewarm water, apply rinse-out conditioner, detangle with fingers or wide-tooth comb and finish with a cool or cold water rinse. 2. Towel blot and apply a styling cocktail consisting of a leave-in conditioner, defrisant and styling mousse, cream or gel. 3. 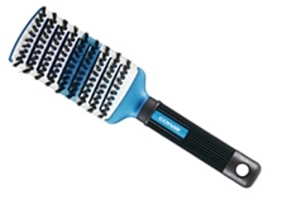 Separate damp hair into eight equal horizontal sections. Create a side or deep side part. 4. Blow dry each section with a blow dryer and a 100% boar bristle round or paddle brush to create bend. 5. After hair is 100% dry separate hair into sections again. Use a jumbo curling iron on each section wrapping the hair back and away from the face. After each section is curled roll the strand around your fingers and pin to your scalp to cool and set. 6. 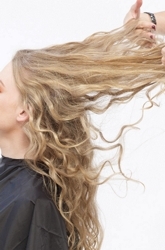 Once hair is completely curls, cool and set, unpin each section. 7. Bend over at the waist to gently tousle each section with fingers by raking. 8. To smooth and finish use a small boar bristle paddle brush to lightly style. 9. Finish with a spritz of hairspray or 1-2 drops of shine serum massaged into the palms of your hands and swiped over the top of the finished hairstyle. This entry was posted on Friday, July 8th, 2011 at 7:24 pm	and is filed under Hair. You can follow any responses to this entry through the RSS 2.0 feed. Both comments and pings are currently closed.